Zoë is 12 years old and loves cats. She loves learning about cats and how best to take care of them and has agreed to share her knowledge with us as she learns. When she’s not hanging out with her two cats Libra (age 4) and Spooky (age 14), Zoë likes to read, draw, cook and swim at the beach. I don’t think I’ve met anyone who doesn’t like Christmas, not even my cats. The problem is Christmas can be a little dangerous for them and some of the things they enjoy most are very risky for their safety. So as a cat owner it’s my responsibility to know how to keep my cat safe. A Christmas tree is one of the most iconic symbols of Christmas, and why wouldn’t it be? You decorate it, put presents underneath it and gather around it with your family on Christmas morning. But you know who else loves it? Your cat. Cat’s LOVE to climb up Christmas trees and pull down the decorations. 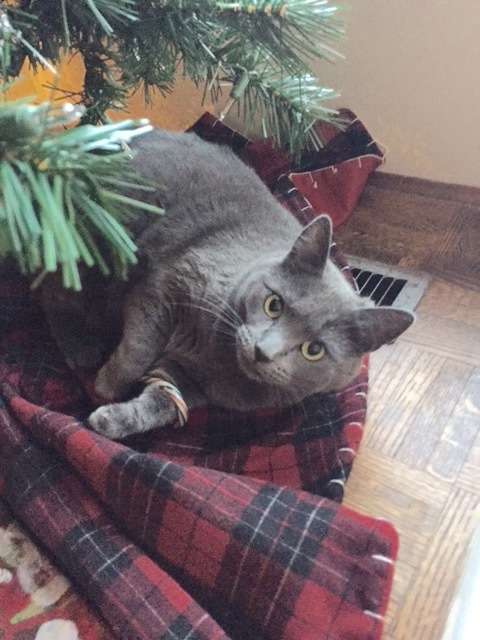 If you don’t want your cat swatting at your tree, consider not putting decorations on the bottom. The needles of live Christmas trees are poisonous for cats and can cause symptoms like oral irritation, vomiting, diarrhea and trembling. Artificial trees can also be dangerous if eaten because of the toxins they release. Make sure your tree is secure so your cat won’t climb it. If you put your tree in the middle of the room your cat might see it as a play structure and will be climb it from all sides. It will also be easy to knock over if your cat does get in it. Cats also love tinsel. If you think putting it high up on your tree will prevent your cat from getting to it, remember cats can climb trees and will if they see something they want to play with. Once a cat gets it’s paws on tinsel they might swallow and choke on it. Decorations such as ribbons are also very dangerous should your cat eat one or if it gets around their neck. Don’t you love holly, mistletoe a poinsettias? Well your cat doesn’t. These plants are all very poisonous to your cat. Mistletoe causes vomiting, diarrhea, breathing difficulties, erratic behaviour, hallucinations, collapsing and death. Holly causes vomiting, diarrhea and depression. Fortunately, poinsettias are less dangerous. They cause mouth and stomach irritation and sometimes vomiting. If you choose to display these plants, remember to put them in places your cat will have trouble getting too. Also be sure to know the symptoms of poisoning so you can keep an eye out for them. Holiday parties are a super awesome part of the holidays, but they can be quite overwhelming for your cat. Maybe your cat is very social and loves visitors, but it’s most likely your cat will be pretty scared. Have a visitor free room and politely ask your guests not to go in there. Keep a litter box, some food, kitty toys, beds and blankets in the room to make your cat feel comfortable. Close the door as your guests are coming in so your cat doesn’t get out, but afterwards leave the door open a bit. That way your cat can get in and out if he wants to. Some people like to incorporate Christmas food into their cats diet, but I suggest keeping human food away from them. Especially rich fatty foods which can make your cat sick. Artificial snow is also always poisonous. I love lighting candles in the winter, but I need to always remember to never leave a lit candle unattended and keep a watchful eye on it. Cats are curious creatures! Yes the holidays can be a potentially dangerous time, but you can keep your cat safe by following these simple steps. With these tips you can enjoy Christmas without worrying about holiday hazards. Very informative, Zoe! Now I need to see if my house is “cat proof”! Ginny, our cat, is very curious and has been in the tree and eaten the plants! Thanks for the reminder to keep our cats safe at Christmas! I have two cats. Thanks for the very helpful information. Thanks for the reminders, Zoë. This is our first Christmas with Jelly, so we’ll how she does. A Happy Reunion for Oreo! Come run with us on June 23!